For Christmas last year, I made my little darlings slippers. I showed you pictures here. 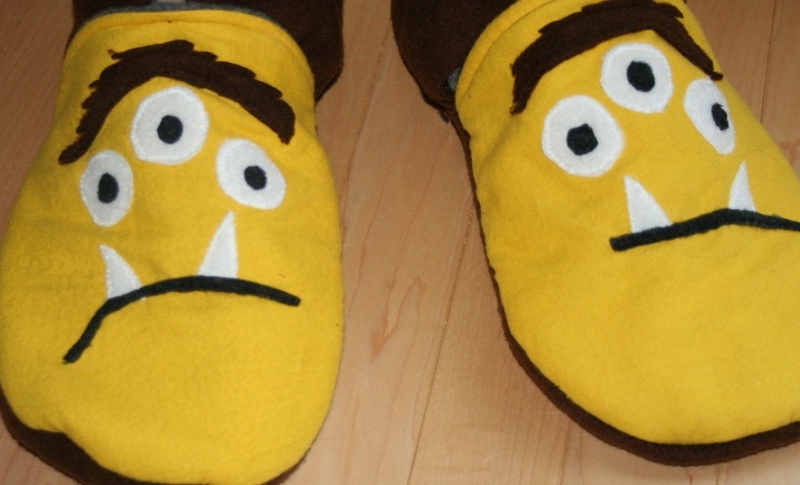 I used to have fleece slippers, they were my favourite. I wore them all the time, but alas they wore out and I had to part with them. That combined with the fact that my darlings were often looking for slippers while they played their numerous made up games led me to make them their own. I used this pattern/tutorial﻿. Of course the pattern did not cover the range of sizes I needed, so I traced the kids feet and used the pattern as a guide to draft my own. I love them. The most loved ones from above are the green kitties. My daughter wore them every day until she lost them (I found them eventually). I made them for my better half. I actually made 99.9% of them a few months ago, but they sat in a drawer waiting for that last piece of elastic to be added. Today was the day. My freezing office at work today must have put me in the slipper mood. 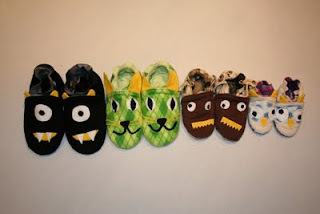 I used the same pattern as above to draft the adult size slippers. Overall I am happy. The most important thing about them is that they are comfy! My 2 year old noticed the "eyes" right away, no doubt trying to figure out why there are 3 of them. I crocheted myself a pair of slippers this year, but I think I may just have to make myself a fun fleece pair as well.